Why are so few freelancers able to make the leap from consulting to products? It’s not because they haven’t found the right “idea”. Those are everywhere and you’ve already had plenty that would work for you. It’s not because only a lucky few have uncovered some kind of magic formula. Those strategies and tactics are out there for anyone to figure out as they go. The real challenge in getting your product business to a point where it can replace your income from consulting is keeping a steady supply of time and oxygen. You need time (working hours, days, weeks, months) to make any sort of progress in a new product business. And your business needs oxygen (customers, audience, exposure) in order to gain traction and grow. But when you’re bootstrapping this thing “on the side”, it’s nearly impossible to sustain either of these if your new product business is not profitable. 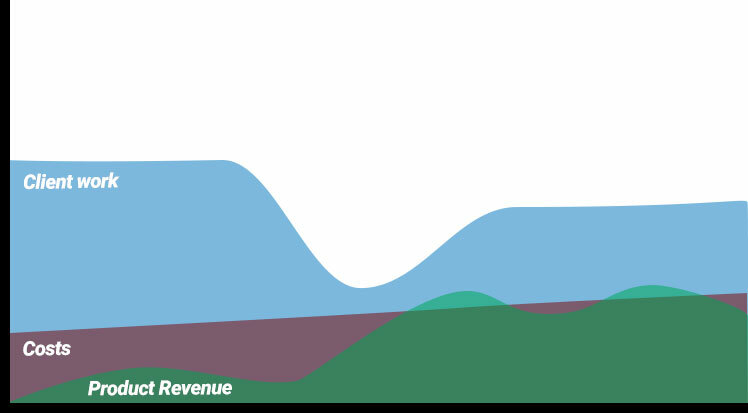 This article is my attempt to talk about that p-word that too often gets drowned out by the allure of revenue reports and splashy launches (things that I certainly have over-emphasized at times just as much as the next guy). By the end of this article, I’ll share my 3-phase roadmap to transitioning to products. This is what worked for me. I’ve seen it work for many others. It has the most predictable rate of success that I know of. Spoiler alert: That roadmap, of course, begins with launching a productized service. It’s no secret that I believe this model is ideal because it’s the path of least resistance. More to the point: It allows you to make progress profitably the whole way through. And it gives you the leverage you’ll need to keep time and oxygen flowing in the right direction. But first, let’s start with that p-word. Fact: If you’re not paying yourself a salary, you’re not profitable. Assuming you’re not taking outside investment and you’re unwilling to go into debt (both are the case for me), then getting your product business to a point where it can pay your salary is extremely difficult (read: takes a lot of time and focused energy). I’m not talking about your “dream” salary. I’m talking about your baseline number that you need to cover your bills each month. When I was in my twenties, single, living in New York (a more expensive part of the US), that number was somewhere around $4,000/month. Now I’m in my thirties, married with a growing family (and currently the sole breadwinner), that number is closer to $10,000/month. I’d imagine your baseline number is in this ballpark if you’re living in the US or other developed countries. So if your product business isn’t coming close to covering your base number, then you’re heading toward the wall that most people hit: The day you decide that plugging away at this product business “on the side” is no longer sustainable. Sure, there are levers you can pull to make your product more profitable, such as charging more per customer and targeting the right audience. But pricing and marketing strategy alone are not enough to ensure you’ll make the leap before you run out of time and oxygen. 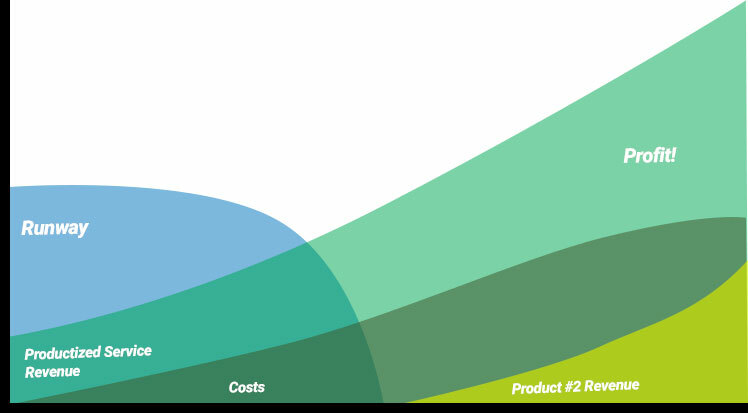 Traditionally, a startup’s launch trajectory looks something like this (in theory): Costs exceed revenue in the early months until you reach a break even point and get to profitability. But that assumes that you have a runway to cover your costs (including your salary) during those unprofitable months. Perhaps you’ve saved up a large nest egg, or your spouse’s salary supports your family while you’re in startup mode, or you’ve taken outside investment—all perfectly viable paths forward. Personally, my resistance to these options boils down to my risk tolerance. There isn’t a way to know how many of those unprofitable early months there will be. This uncertainty can lead to some stressful times ahead. You start out by doing client work to pay your salary, while you try to find the time to plug away at your little product side project. But without enough focused time and energy, the product struggles to get the oxygen (customers, audience, exposure) it needs to grow. So you reduce your client work to re-allocate more of that time to your product business. 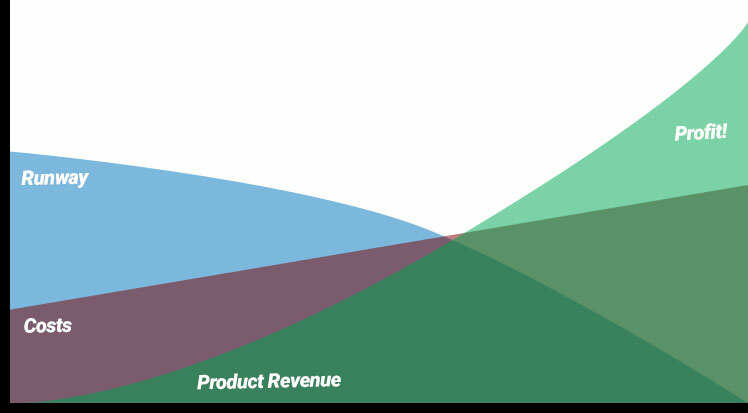 With more energy and focus, you’re able to grow product revenue up to a point where it “pays for itself”. But it doesn’t quite make enough to pay you, so you have to go back to client work to keep your bills covered while the product business stops growing or stagnates. This was more or less the story of my first business. Over the course of 4 years, I phased client work down, then back up, then down again. Fortunately, I managed to grow the product to a point where I could make a profitable exit. But the truth is, during the years I owned that business, I never managed to get it to a point where it could pay 100% of my baseline salary. It reached 60/40 at best. I covered the gap in the early years with client work, and in the later years with selling an info product. Still, we hit a few financial tough spots along the way, and while there were plenty of “wins” there just as much sleepless, stressful, nights. What I learned (the hard way) is using client work to self-fund a product business has some very real shortfalls. Like I illustrated above, time is your first hurdle. You only have so many hours in the day, and many of them are committed to family, leisure, and sleep, which should be non-negotiable. The few spare hours you can devote to working on your product lack the creative energy and focus needed to be really productive. If your client work does nothing more than pay your bills, then it’s also costing your product business oxygen. In other words, money is not the only thing your product business needs. It needs a customer-base, an audience, and exposure. If your client work doesn’t also help to funnel potential customers to your product, help you establish your brand, or produce other byproducts, such as software, human resources, or your email list to fuel your expansion into products, then you’re missing a huge opportunity. Self-funding a product business with “client work” has some very real shortfalls. So here is is. The best roadmap I know of if your goal is to make the transition from freelancing (or even a job) to owning a product business, and complete this transition in about a year. The concept is to launch your business in the form of a productized service first. Then leverage the profit, the brand building, the learning, and other byproducts to fuel the launch of the next product. By following this roadmap, your runway doesn’t have to last as long, and your products are much better positioned for success because they have the oxygen they need. Who will you serve as your target customer? What is this customer’s problem (that you’re well-positioned to solve)? What is the end result(s) that you’ll deliver for your customer? Notice I didn’t say define what it is your product will actually do. This will come later. For now, start with the problem and fall in love with that problem, as well as who you will solve that problem for. You won’t find these answers overnight. And it’s OK if you change course along the way. In fact, changing course means you’re actively learning, which is a good sign. Just know that the clearer you get on these questions I listed above, the easier everything else gets. Fall in love with the problem and who you’ll solve it for, then everything else gets easier. B2B software business owners. My people. Content. They know content is important and probably already doing it. But they lack the in-house resources to do it (effectively). I know content marketing and have built and sold a business using it. I can solve this problem. Quality, well-researched content published on their behalf, resulting in a growing email list and customer-base. Over time, I refined these answers more and eventually built out the solution(s) we offer. But it all started with who and what problem to solve. With a clear “idea” for your new business (a.k.a. problem to solve), you can and you should begin solving that problem for paying clients, right now. Since you’ll be delivering this as a done-for-you service, largely done manually, there is very little development time required to get to launch. I’ve published plenty of free content as well as my flagship course, Productize, to go deep on how to do this. Brand/Audience – Launching your productized service isn’t just about making a quick buck (although it does grow revenue faster than anything I’ve seen). It also launches your brand. Meaning, you’re planting your flag, staking claim to the problem you’re solving, and who you solve it for. Today, you solve it with a high-priced done-for-you service. But soon enough, you’ll offer other, related products.Through launching and marketing your productized service, you’re also building your audience in this space. You’re building an email list. You’re building brand recognition. And you’re getting paid for it. Learning/Byproducts – Through refining your done-for-you service, you’ll naturally develop valuable byproducts, which you’ll leverage sooner or later. Perhaps you’ll develop your own software tool to make delivering your service more efficient. And/or you’ll develop more expertise and credibility than anyone in this space, positioning you perfectly to release an educational product on the subject. After six months to a year of building your productized service, you’ve established your brand, you’ve started to build an audience in your space, and you have cash on hand to reinvest in growing your business. The key is to leverage the byproducts of your productized service to expand your product line, this time aiming for a more scalable/passive income type of product. Now that you’ve laid the groundwork, you’re much better positioned to be successful with this type of product. But let me be clear: You’re not launching a new startup at this point. You’re growing your main business and following your original mission by adding a 2nd product to it’s product line. It will serve the same market, but perhaps cover a slightly different segment of your audience. Software – Through delivering your productized service, you’ve found that building your own software tool helps you deliver that service more efficiently. Investing in building this software not only increases profitability of your service (since it makes your delivery more efficient), but it can also be released as a tool for others to use. Educational Products – Through delivering your productized service, you’ve established deep expertise in a highly focused problem area. You’ve refined your specific recommendations based on actual results you’ve delivered time and time again. This positions you perfectly to teach your solutions in the form of an educational product, such as a book, a course, or a membership program. You might hear me reiterate this idea of taking the path of least resistance quite often. That’s because this advice often gets overshadowed by the latest marketing tactics, revenue reports, and others’ highlight reels we see online. But what it really boils down to is putting yourself in a position to have the best possible chance of achieving your goal, which I assume is to transition from consulting to products. Start with a problem and a target customer. 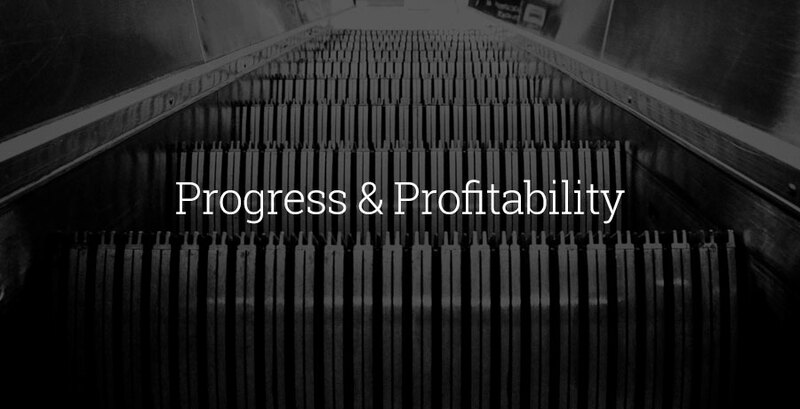 Make progress by solving that problem as a productized service. Then leverage that forward motion to expand your product line. And do it all profitably the entire way through. A free video crash course. Get my free video crash course and learn how to break free of billable hours, systematize, and scale using the productized service model. Subscribe and get this guide to help you figure out how profitable your business needs to be in order to sustain your transition to products.